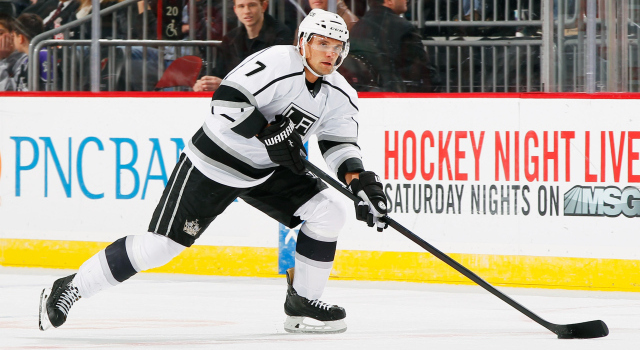 -I’ve been told by hockey operations that the Kings have held very preliminary discussions with Andrej Sekera about a potential contract extension. The interest in re-upping Sekera is mutual, both on the defenseman’s part and on the Kings’ behalf. As has been reported throughout the year, the Kings do not have ample cap space and have already committed roughly $64.15 million to 17 players for the upcoming season. NHL commissioner Gary Bettman recently projected a $71.5-million salary cap for 2015-16 when speaking with Sportsnet’s Chris Johnson, though there is no guarantee that the cap will go up. Sekera and his representation are obviously aware of the team’s financial mindfulness and that several moving pieces (contract negotiations with RFAs Tyler Toffoli and Martin Jones are among them) will likely be handled before negotiations escalate and firmer numbers are exchanged. But, it does appear as though Sekera wants to stay in Los Angeles, where there is a comfort level between him, the players, coaches and front office. Should the team and Sekera ultimately reach an agreement, it most likely would not take place until June, when the team is more aware of its “direction” in personnel moves and whether there will be sufficient room under the cap. Sekera had four points (1-3=4) in 16 games with Los Angeles prior to suffering a season-ending lower-body injury on March 30 at Chicago. Through 73 total games with the Kings and Hurricanes in 2014-15, Sekera had three goals, 23 points and a minus-three rating. -There’s nothing new to report on negotiations with RFAs Tyler Toffoli and Martin Jones, both of whom will play for Team Canada at the World Championships. The team doesn’t anticipate any roadblocks towards reaching an agreement with Jones, though, as I’ve reported previously, Toffoli’s next contract will take slightly more time and consideration. Andy Andreoff, Nick Shore and Jordan Weal are also restricted free agents in addition to Nic Dowd, Vincent LoVerde, Andrew Crescenzi and Andrew Bodnarchuk. -I had virtually written off Paul LaDue as being expected to return to North Dakota for his junior season, but at this point, the versatile defenseman still hasn’t come to a decision as to whether he’ll play NCAA or professional hockey next season. It’s still most likely that LaDue will return to Grand Forks, but it isn’t a given at this time. -Negotiations with Anze Kopitar have not yet begun. Kopitar, who has one year remaining on his current contract, is eligible to sign an extension on July 1.